Our Private Investigator’s Workers’ Compensation Claims Division serving Los Angeles, Orange, and Riverside Counties has conducted over 1000 AOE/COE interviews and hundreds of Sub Rosa investigation pertaining to Workers’ Compensation dubious claims. We have over twenty-five years’ experience conducting Workers’ Compensation suspect insurance claims starting in 1993 with Hughes Aircraft in El Segundo, California, followed by State Compensation Insurance Fund in California, the Los Angeles Metropolitan Transit Authority, the County of Los Angeles Risk Management Division, and the Los Angeles City Attorney. We have independently saved our clients millions of dollars by uncovering fraudulent Workers’ Compensation claims. Our workers’ compensation claims examiners and third-party administrators never have to wait long for our investigative reports or our Sub Rosa videos to be submitted. We never missed a deadline or been late to file a report. We can assure claims adjusters that they will be consistently pleased with the quality, efficiency, and professionalism of the investigations Worldwide Intelligence Network conducts to help resolve claims timely. WIN has successfully documented evidence of fraud in over 80% of its investigations yet no investigation by Worldwide Intelligence Network is undertaken with a preconceived notion that all claims are fraudulent. Worldwide Intelligence Network conducted surveillance on a claimant who alleged a severe injury to his foot. He had been off work on an accepted claim for over a year. An independent medical doctor’s report stating he could not find anything wrong with the claimant’s foot. When the claimant was observed exiting his home, he was limping. However, he was limping on the wrong foot. The claimant was further observed going into a Chiropractor’s clinic. Just before he walked into the clinic video was taken of him putting on a foot brace and taking out a pair of crutches from the trunk of his car. When he exited the clinic, he took off the brace and put his crutches in the trunk of his car and drove over to a soccer field where he participated in a soccer game while our investigator videotaped the entire game. However, that was not the end of it because the claimant’s attorney could assert that his client took pain medication that day to participate in that game. Surveillance continued, and the claimant was caught running from a grocery store during a snow storm while pushing a heavy shopping cart. The claimant ceased receiving payments from the insurance company and when a copy of the videotape was seen by the claimant’s attorney he resigned from the case. The Los Angeles District Attorney prosecuted the case. If you are an uninsured business, you can still combat fraudulent claims. You forgot to mail in your workers’ compensation premium, or you didn’t have the funds at the time to pay the premium, and you had to lay off some employees. 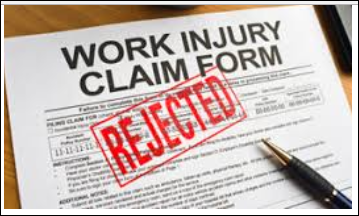 Days after the layoffs, one of your employees filed a work-related injury claim through an attorney. You subsequently learned that former employee found another job working under the table and you needed evidence to present to the Workers’ Compensation Appeals Board (WCAB). We can help you! You are not alone, and you are not the only business to be in this predicament. We will gather evidence on your behalf that your former employee is working and that the work they are doing contradicts his/her alleged injury. We can save you from paying thousands of dollars in medical expenses and workers’ compensation payments. We can protect you from becoming a victim of insurance fraud.